Ependymoma may affect both the fourth ventricles and spinal cord. Ependymoma is characterized by the symptoms and signs such as nausea, vomiting, seizures and raised intracranial pressure. 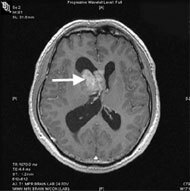 Ependymoma is a tumor which arises from the ependyma of the ventricular system. Ependymoma consists of symmetrical cells with round nuclei. The cells are arranged in a perivascular pseudorosette formation in a fibrillary stroma. There is also the present of blepharoplasts which is basal ciliary bodies with rod near nucleus. Ependymoma may present as tumor ( papillary masses tumor which extend from the floor to the fourth ventricle) which obstruct the flow of cerebrospinal fluid ( CSF). This condition is known as obstructive hydrocephalus. Ependymoma carries a poor prognosis as the tumor is near to the nuclei of the brainstem. Ependymoma is common in children. Ependymoma may occur in adult. However, in most cases, ependymoma may affect the spinal cord of adults. The treatment may include surgical excision. 1.Mørk, Sverre J., and Aagot C. Løken. “Ependymoma. A Follow-up Study of 101 Cases.” Cancer 40, no. 2 (1977): 907–915. doi:10.1002/1097-0142(197708)40:2<907::AID-CNCR2820400247>3.0.CO;2-2. 2.Ernest C. Fokes, Jr, and Kenneth M. Earle. “Ependymomas: Clinical and Pathological Aspects.” Research-article. , May 7, 2009.